We were excited to be featured in a promotional booklet of regional NSW included in the December issue of New Zealand’s Cuisine magazine. 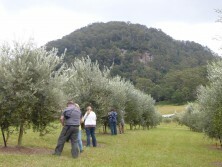 Titled “50 reasons to visit New South Wales” it includes 10 must-do activities in each of 5 regions. We appear under the South Coast section with other wonderful foodie experiences! We’ve just released our Tasty eNews for May 2014. If you’d like to have a read, check it out here with news, tour dates, new producer profiles and some details on local cooking schools. Enjoy! 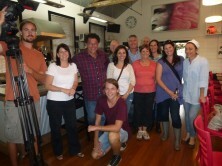 We had great fun filming with Mike Whitney and the team from Sydney Weekender once again. 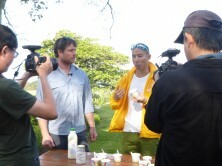 The episode is going to air this coming Saturday, 5 April, so be watching at 5.30pm on Channel 7. The team filmed three of the venues we visit on our Foodie’s Indulgence ‘Tastes of Saddleback’ tour which showcases producers in the Kiama, Jamberoo and Gerringong region. On the day the weather was amazingly great given the serious floods and storms that besieged the South Coast the night before. So on a surprisingly sunny day on our lovely south coast you’ll meet Gerhard from Schottlander’s Wagyu, Kel from The Pines gelato and Kirsten from The Schoolhouse artisan cheese and tea. 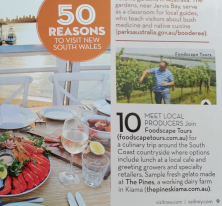 The Shoalhaven Coast Winter Wine Festival is just under three months away and this year Foodscape Tours is offering a charter tour as part of the festival fun. Held on the June long weekend we’ve attended the Festival over the past few years and loved the vibe and activity along the Shoalhaven Coast. The Autumn issue of South Coast Style magazine is out… The ‘Town of Treasures’ story lists a range of wonderful eateries and other shops to visit in Berry – some of them are our all time favourites! And some of them are treasures that you will get to sample for yourself on our tours! We turned 5 today! What a ride it has been: we’ve seen a lot of change following our initial start in Byron and the development of our South Coast operation just over 4 years ago, now our sole focus. We’ve said hello and goodbye to many wonderful producers and growers, taken out some awards and enjoyed hosting people from all over the country and other parts of the world on our tours. Thanks to everyone for being part of the journey! A special thanks to the gorgeous Karen, who was there at the beginning. And a big thanks also to Gordon and Tony, our main drivers, for getting us around safely on tour day. We are excited to be planning new tours and more foodscaping fun in 2014! 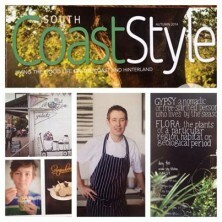 South Coast foodscape showcased in the Sun Herald! Exciting to read this story in today’s Sydney Morning Herald Traveller section, mentioning some of our friends and farms in Jamberoo, Kiama and Gerringong. 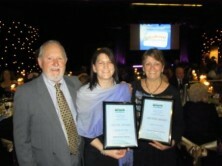 Our thanks to Kate and the team from Kiama Tourism for organising this media showcase late last year. These are just some of the places we will be visiting on our ‘tastes of Saddleback’ Foodie’s Indulgence tour this year (kicking off in Autumn). Read the story here. We were chuffed to receive a note from the Mayor of Kiama after he read the story by Sally and Gordon Hammond of website ‘Food and Travel’. 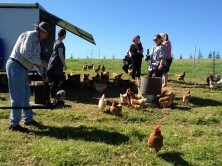 Sally and Gordon were part of a media tour late 2013 to check out the foodscape in and around Kiama, Gerringong & Jamberoo. “I have just read the report on the recent famil tour of our area in ‘Food and Travel’ and of your assistance to the writers. It was a great report. Congratulations on your efforts. I hope all is going well…” Regards, Brian Petschler, Mayor, Kiama Municipal Council. Pretty cool! Here’s the story and video if you’d like to check it out.